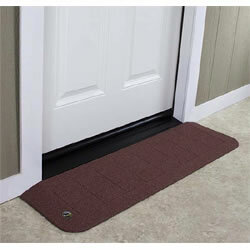 Lightweight residential threshold transition ramp with superior slip resistance. Made from advanced composite recycled plastic. 42" Width and up to 1-1/2" threshold height, 4000 pound weight capacity. SafePath Products BigHorn™ Ramps offer safe accessible entrances for your home. BigHorn™ Ramps use advanced recycled plastic technology offering the newest in safe, lightweight residential threshold transitions with heavy load capabilities. Designed for superior slip resistance, StoneCap™ coating technology incorporates ceramic coated quartz crystals, offering an enduring surface that is UV stable and guaranteed not to crack or fade. Unlike aluminum, BigHorn™ Ramps will not freeze or become slippery in wet or cold environments. In addition, molded mitered ends provide a high quality finished product attractive enough for the most discerning homeowner. Available in attractive granite and earth tone colors to accentuate any home or residence. BigHorn™ Ramps modify existing thresholds up to 1-1/4” (1-1/2" with added shim kit), and have molded traction pads for both slip-resistance protection and visual appeal. A gradual tapered front edge with molded 22º side slope provides safety and access with an attractive finish. Can be vertically cut for height and notched for door molding with typical rotary saws, “it cuts just like wood”. All BigHorn™ Ramps come with peel and stick tape for quick and easy installation, making it a snap to install. BigHorn™ Ramps are the only recycled plastic transition ramp offering superior slip resistance utilizing a ceramic quartz surface.